In Oil, Power, and War, French journalist Matthieu Auzanneau presents a comprehensive, provocative history of humankind's relationship with oil. His account takes us from the first references to oil in ancient literature and scripture, to its current status as the lifeblood of the industrial economy, to its inevitable future demise as a usable energy source for our society. The book was first published in France in 2015 as Or noir (meaning "black gold"). This new edition is a nicely rendered English translation that extends the original narrative to the present. The book uses the four seasons of the year as a metaphor for the life cycle of the modern oil era. The first season, spring, was preceded by a centuries-long "germination" in which all the factors that led to our current, utter reliance on fossil fuel slowly fell into place. For most of this time humankind's use of oil remained small-scale, but it launched into an ever-upward spiral with the development of the first commercial oil wells during the late 1850s. Spring began in 1945, when America's post-World War II economic boom propelled world oil consumption to meteoric new heights. Summer saw America lose her status as the world's oil production powerhouse and become dependent on overseas oil. Today we're 20 years into autumn, a season defined by the peaking of global oil extraction. We're woefully unprepared for the winter we face, in which oil will begin its irreversible decline. The learning curve involved in humankind's exploitation of oil was especially precipitous in the beginning. Auzanneau describes how those who produced the first oilfields did so at what today would be considered a reckless pace, not yet understanding that extracting the oil too quickly damages the reservoir, greatly reducing how much oil can ultimately be recovered. People also gave little thought to ecological impacts. When oil companies first began drilling in water, spills in marine environments were common and weren't seen as tragic. The primitive state of early petroleum refining technology also posed particularly egregious repercussions for human health and safety–lamp fires caused by crudely distilled kerosene regularly claimed lives. Auzanneau's timeline dates the beginning of spring to the Allied nations' defeat of the Axis in 1945. Like many who study history through the lens of energy availability, Auzanneau argues that this triumph was the result of geological good fortune in the form of America's vast, barely tapped oil reserves (U.S. oil accounted for up to 90 percent of the total oil used by the Allies). It was a victory that would dramatically shape the nation's future development and sense of herself, contends Auzanneau. In the process of marshalling the unprecedented military might needed to beat the Axis, America primed herself for the era of explosive, hitherto unfathomed growth that would follow. There's a lot to cover in recounting the spring season, so it's fitting that it takes up the longest section of the book. Citing books, journal articles, news reports, government statistics and U.S. Senate proceedings, Auzanneau meticulously chronicles how the oil age came into its own during the post-war period. He details major finds and the emergence of today's oil companies, the founding of multiple Middle Eastern nations, the inception of OPEC (the Organization of Petroleum Exporting Countries), the building of national highway systems around the world, the rise of modern consumerism, the global spread of neoliberal economics and the worldwide population explosion, among many other topics. This history is awfully involved, but Auzanneau staves off tedium with his lively thumbnail sketches of key players. My favorite is that of the touching friendship between President Franklin Roosevelt and Saudi Arabian King Abdul Aziz. The interval that Auzanneau regards as summer began in late 1970, when U.S. conventional crude oil production reached its all-time peak. Suddenly, ballooning oil demand in America collided with falling domestic production, causing ever-increasing reliance on imports. Auzanneau tells the story of how the peak in U.S. oil output had been accurately predicted a decade and a half earlier by Marion King Hubbert, an eminent geoscientist who now ranks among the great figures of the sustainability movement. Unfortunately, Hubbert's warning had been widely ignored, with the result that when the peak came, it caught almost everyone flat-footed. This meant that America was unprepared for the months-long oil embargo that OPEC's Arab members imposed on her and other Western powers beginning in October 1973, in retaliation for their support of Israel during the Yom Kippur War. Summer contains many crucial developments beyond those already mentioned, including the founding of the International Energy Agency (IEA), the beginning of the environmental movement, the establishment of the Intergovernmental Panel on Climate Change (IPCC), the pernicious rise of climate denialism, the oil-stoked financialization of the U.S. economy, the two Gulf wars and the ascendancy of Osama bin Laden. Auzanneau covers all these topics thoroughly and insightfully. He also, due to his French nationality, brings both a keen outsider's perspective to U.S. affairs and an equally invaluable insider's perspective to the dealings of his own nation. Global conventional oil output continued to rise for decades after America reached its peak, but the rate of increase gradually slowed due to the exhaustion of easy oil. Auzanneau chronicles how, by a couple of years into autumn (i.e., around 2000), the production increases had greatly diminished, and the price of oil, which had been stable for decades, started to fluctuate. By the mid-2000s, a drastic price surge had ensued and experts were warning of an imminent state of energy scarcity. Two prominent retired oilmen, Jean Laherrère and Colin J. Campbell, issued their warning well before the onset of the oil price crisis. Auzanneau discusses at length their seminal Scientific American paper from March 1998, in which they predicted that world extraction of conventional oil likely would start declining by 2008. This article received little mainstream notice at the time–since in 1998 oil was cheaper and more plentiful than it had been in many years–but it steadily gained a following. A big part of Auzanneau's aim is to provide a people's history of the oil industry, rather than one told from the victors' viewpoint. To his mind, Daniel Yergin's 1990 book The Prize, which has long been considered the authoritative history of oil, fails in this regard. It focuses exclusively on the major figures in the story–people like John D. Rockefeller and the Rothschild and Bush families–and neglects those at whose expense the rich acquired their wealth. Auzanneau succeeds in imbuing his book with the common people's perspective. To take one example, he trenchantly describes how, during the era of Jim Crow segregationist laws in the U.S. South, these same policies were being exported to Dhahran, Saudi Arabia, where they served to oppress Saudi employees of the American-led oil consortium Aramco. 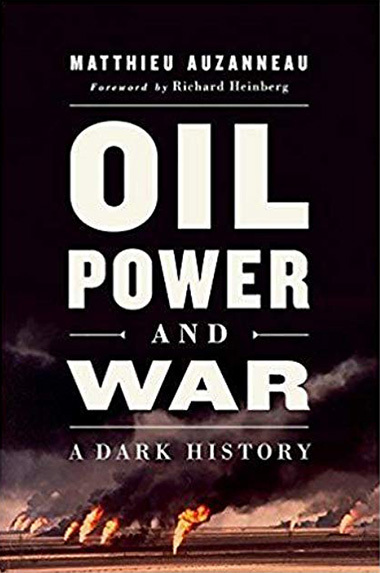 In his foreword to this book, the venerable peak oil author and educator Richard Heinberg highlights four ways in which he believes Auzanneau's history to be superior to Yergin's. Foremost among these, as already noted, is Auzanneau's effort to make his a people's history. Heinberg also applauds Auzanneau's awareness of the critical role energy plays in shaping societies and economies; his understanding that oil's history represents a cycle with a beginning, middle and end; and his ability to capture the story of oil much more fully than did Yergin, thanks to the much more recent publication of his book. To Heinberg, these qualities make Auzanneau's book "the new definitive work on oil and its historic significance." While Yergin's Pulitzer Prize-winning opus remains a massive achievement, I nonetheless think Heinberg makes a compelling argument. One recurrent theme of this book is that making predictions about industrial civilization's energy future is tricky business, and many who do so end up being proven dead wrong. Auzanneau points to President Jimmy Carter's warning in 1977 that global oil demand would begin exceeding available supply early in the following decade–in other words, 40 to 50 years prior to what will likely actually prove to be the case. Much more recently, a number of other people have repeated this blunder. In his 2001 book Hubbert's Peak, the now-late petroleum geologist Kenneth Deffeyes (a notable colleague of Hubbert's) saw the shortfall arriving between 2004 and 2008. What came instead was a flood of new liquid fuels production made possible by the U.S. tight oil boom (popularly referred to as the "shale oil revolution") that took nearly everyone by surprise beginning a decade ago. The new production from shale is, in Auzanneau's estimation, the only thing forestalling the start of oil's winter season. The author is careful not to make too specific a guess as to when this glut will vanish. He ventures only that there's a risk of it ending "perhaps before 2030, even as early as around 2020." Like the Canadian tar sands and the kerogen deposits of America's Rocky Mountain region, tight oil from shale is unconventional oil, or that whose costliness, poor energy return and environmental risk make it an inadequate replacement for regular, conventional crude. The latter, reports Auzanneau, reached its production peak circa 2005 and has since been on an "undulating plateau." Auzanneau makes clear that while the windfall provided by U.S. tight oil in recent years has indeed been a rather providential turn of events, it doesn't match the hype that has been generated on its behalf. He deems the claim that this oil has the potential to turn America into an oil exporter on par with Saudi Arabia to be absurdly overblown. Citing last year's data, he shows that in 2017, oil from U.S. shale accounted for only slightly more than 5 percent of total world output. (In contrast, Saudi Arabia's production made up more than 10 percent.) In addition, while American tight oil has, by the time of this writing, managed to fully make up for the decline in domestic conventional production that has occurred since 1970, it hasn't reduced U.S. dependence on Persian Gulf oil. On the contrary, America is even more reliant on the latter than at the time of the oil shock of 1973. The matter of what to do about the twin crises of fossil fuel depletion and climate change is the great quandary of our time. And, as Auzanneau repeatedly stresses, it is not humankind but the natural world that has ultimate control over the course of events. "Whether we like it or not," he writes, "the laws of nature appear to be on the brink of imposing a radical change in the course of the brief history of human technology."